The Bangalore Employees & Self Employees Housing Co-Operative Society Limited is established to help all the unorganised private and public sector employees to own their house in very reasonable and affordable price. The History of the society goes beyond late nineties, on 27th of November 1999 a social service organisation DISC (Developmental Initiatives for social Causes) was established. The main aim of the organisation was empowerment of labour class employed in the unorganised sector and main focus was Garment workers, Security workers, IT and IT enabled services employees, commerce employees and all other category of unorganised sector private employees. In the year of 2004 the garment workers union was established, The Property services employees union, commerce employees union and IT and IT enabled employees union was established in the year of 2005. We believe that economic empowerment is the solution for all the problems face by the workers community. DISC initiated more than 10,000 self- help groups of women working in the various sectors of unorganised sector. Leading nationalised banks like State Bank of India, Canara Bank and Corporation Bank helped these women by providing micro finance for the immediate needs. 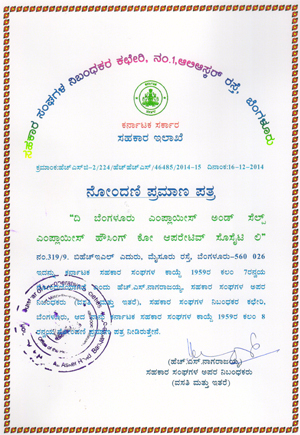 The Bangalore Employees and Self Employees Credit Society was established for providing more elaborated facilities to these thousands of Men and women. Now with the support base of more than 1,00,000 members, The Bangalore Employees and Self-Employees Housing Society established by the founders of the organisations mentioned above to help all the unorganised private and public sector employees to own their house in very reasonable and affordable price.